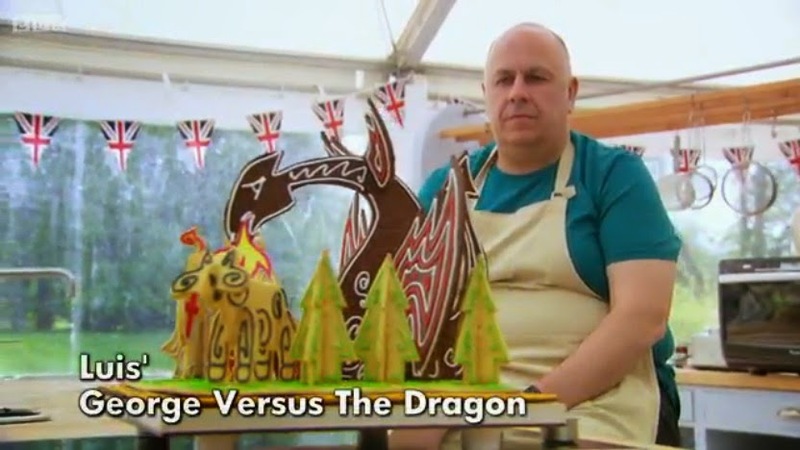 Week two on The Great British Bake Off was Biscuit Week. The bakers first challenge was to make 36 savoury biscuits, of any flavour they liked, but that could be eaten with cheese. Of course when making so many biscuits, consistency of the size, bake and colour of the biscuit is paramount. Mary wanted them to either have a nice crumble or nice snap depending on the type of biscuit. 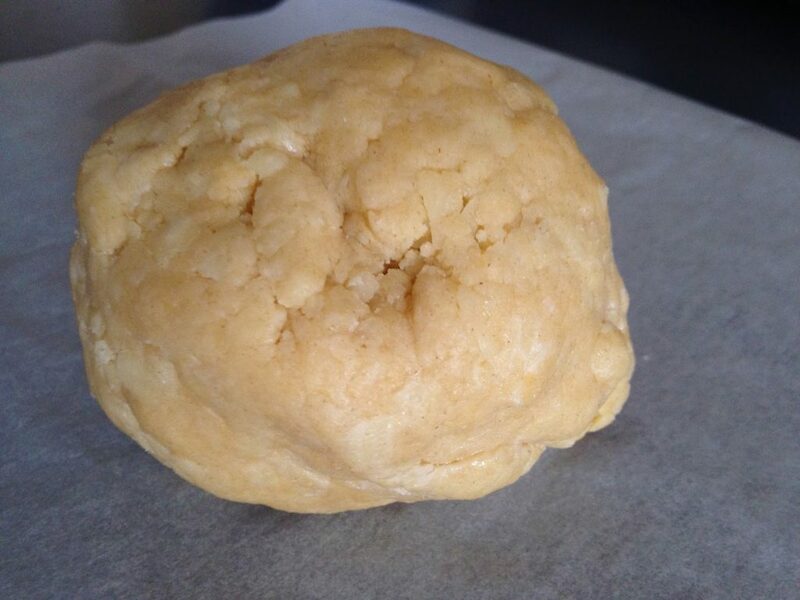 I’ve made some Cheese & Marmite Pinwheel Biscuits this week and you can find the recipe at the bottom of the page. I was impressed with all the different flavours and types of biscuits the baker’s created. There were exotic sounding biscuits like Chetna’s Fenugreek & Carom Crackers, and Iain’s Za’tar Fig Biscuits. There were also some traditional bakes like Norman’s Farthing Biscuits and Diana’s Parmesan Triangles. 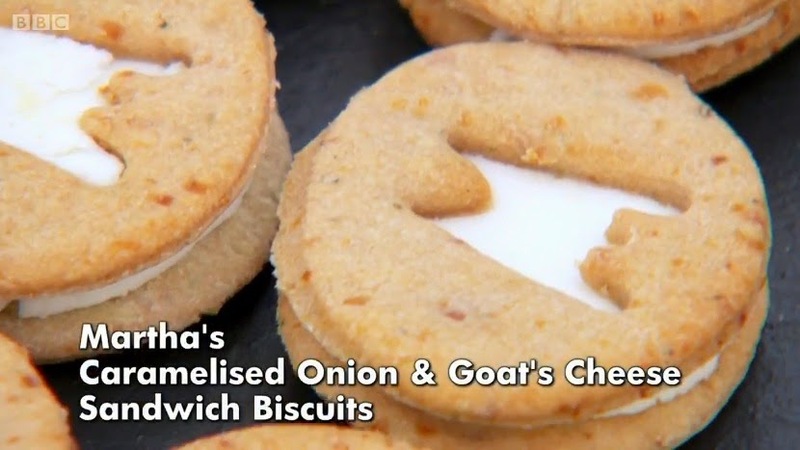 Martha’s would definitely be the ones I would try first, and her Caramalised Onion and Goat’s Cheese Sandwich biscuits went down very well with Mary and Paul. Richard did very well, as did Nancy and Norman. Jordan’s Sourdough Parmesan & Chilli Biscuits were a tad overbaked, whereas Diana’s and Kate’s were underbaked. 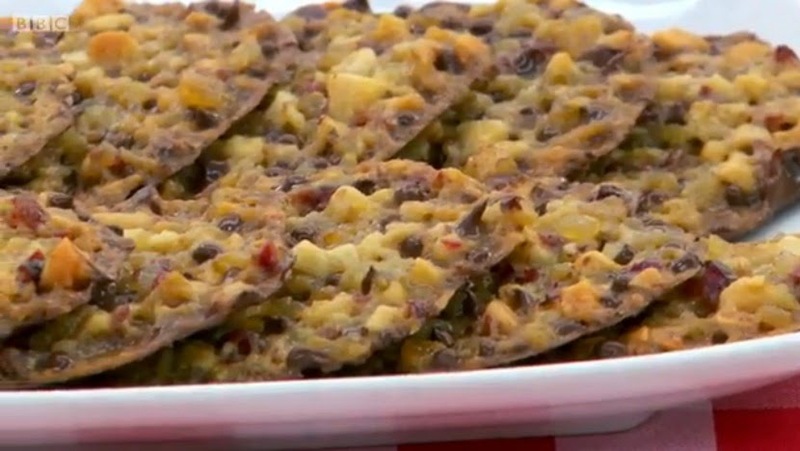 This week’s technical challenge was another Mary Berry recipe – Florentines. 18 were required, and according to Mary they should have a delicate, lacy appearance with even distribution of chocolate. 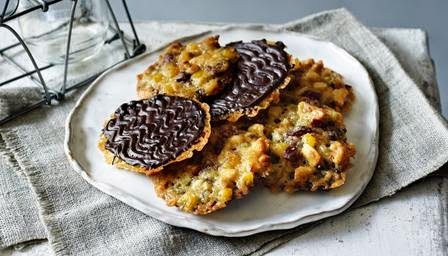 I’ve never eaten or seen Florentines before and they certainly look tricky as they are so thin! It didn’t sound like any of the bakers had made them before either. The main struggle was getting exactly 18 and lots of the bakers weighed their mixture out. No baking time was provided so they all also had no idea how long to bake them for! Martha was the only Richard won the challenge, with Nancy second and Luis third. Iain was in last place, with Norman and Enwezor not far behind. 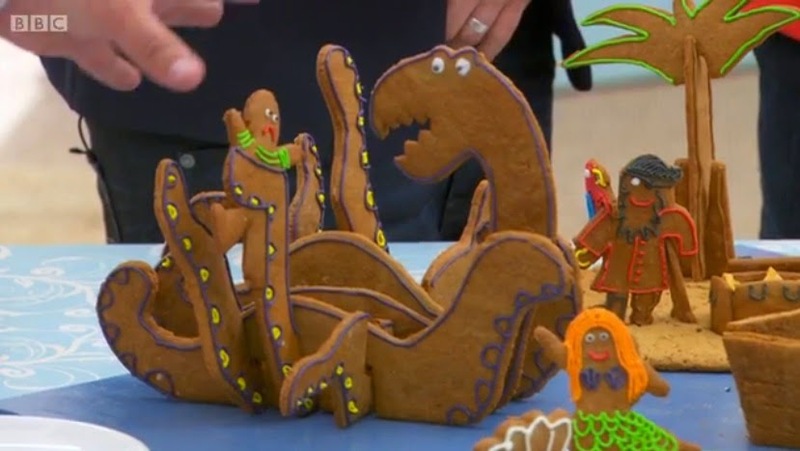 For the showstopper, the judges requested a 3D biscuit scene that must stand up. Precision was the most critical element of this challenge and the baker’s were making some very exciting and ambitious biscuit creations. Chetna had a large biscuit carousel planned, Diana was making a Steam Train that was baked in a cyclinder shape, and Martha was planning a Ski Village complete with a chair lift. 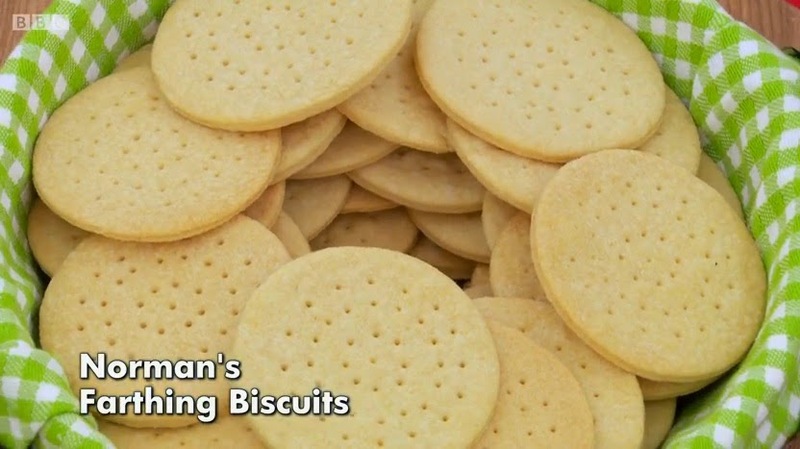 As much as I love Norman, his biscuits were not flavoured and although he did well in the first challenge, I think he does need to start experimenting with flavour. Richard’s pirate scene and Luis’ George & the Dragon scene were the two best showstoppers in my opinion. They were both stunning. Well decorated, well structured, and from what Paul and Mary said – tasted great! I really was blown away by both of them. Iain picked himself up again after not doing well in the first two challenges, as did Diana and Kate who all got good comments. 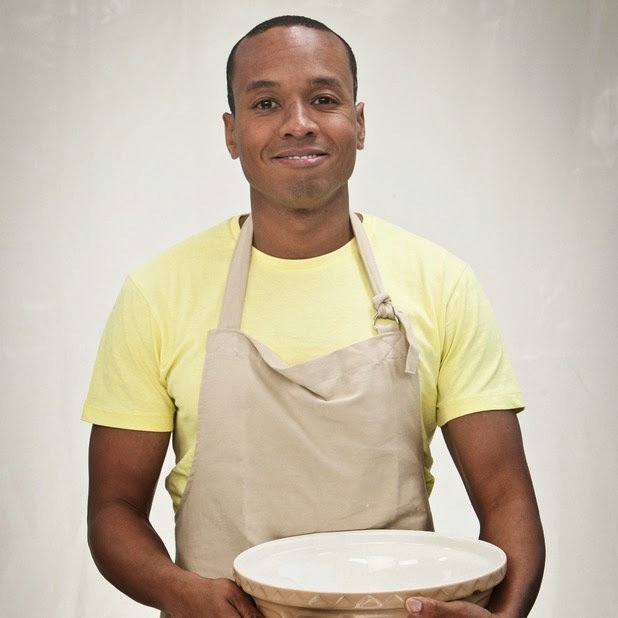 Enwezor stacked his biscuits and used shop bought fondant which was the final blow for him and he left the competition this week. Richard was crowned a very well deserved Star Baker! I’m not a huge biscuit fan, although I do definitely like them, they’re not top of my list. So I find biscuit week the least interesting. I struggle even more with savoury bakes as I’m such a sweet lover! Cheese is one of my absolute favourite savoury foods and I adore Marmite. I’ve made some Cheese & Marmite Scones before, so I thought Cheese & Marmite Pinwheel Biscuits would be equally as yummy, plus pretty too! I started with plain flour and butter in a bowl. I rubbed it together with my fingers until it looked like breadcrumbs. Then I split the mixture equally (I weighed it to be precise) between two bowls. In one bowl I added grated mature cheddar. 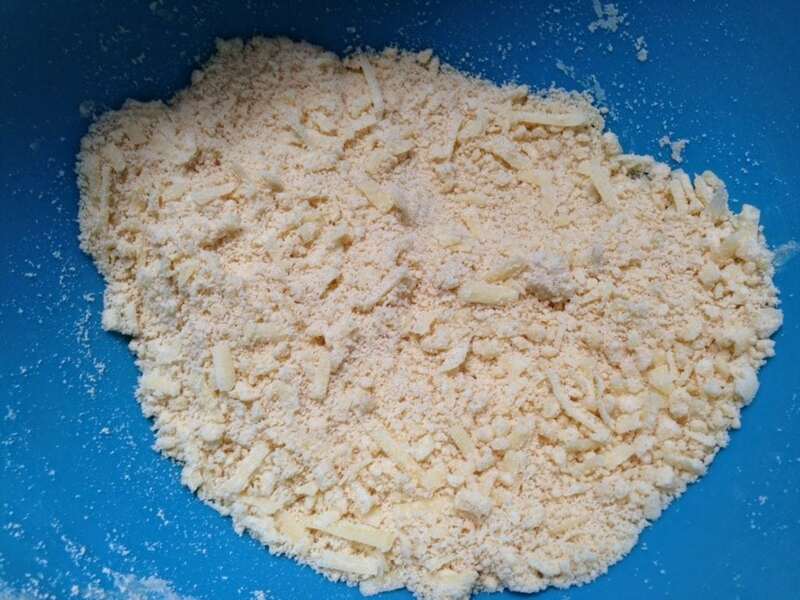 I mixed it in well with a spoon and broke the grated strips of cheese up into as small pieces as I could. Then I added egg yolk and mixed it in. I added some of the egg white to bring it together until it formed a dough. With the other mixture I added Marmite and egg yolk. Again I added some of the egg white to bring it together until it formed a dough. I rolled out both doughs onto greaseproof paper until they were a similar size. Then I carefully placed the Marmite dough over the cheese dough. 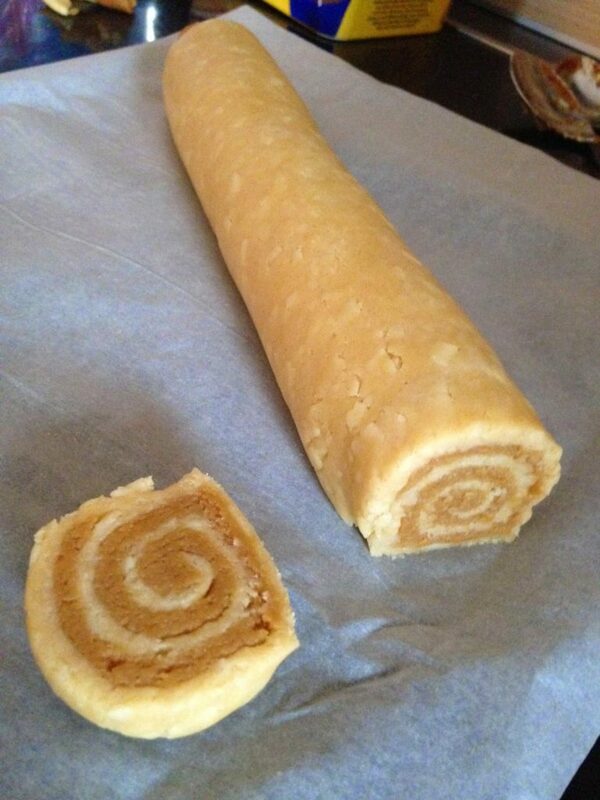 Slowly and carefully I rolled the dough into a tube. As you can see it makes a lovely swirl! I wrapped it in cling film and chilled it in the fridge for about an hour. Using a sharp knife I sliced up the tube of dough into pieces about 8mm thin, and placed onto a baking tray lined with baking paper. 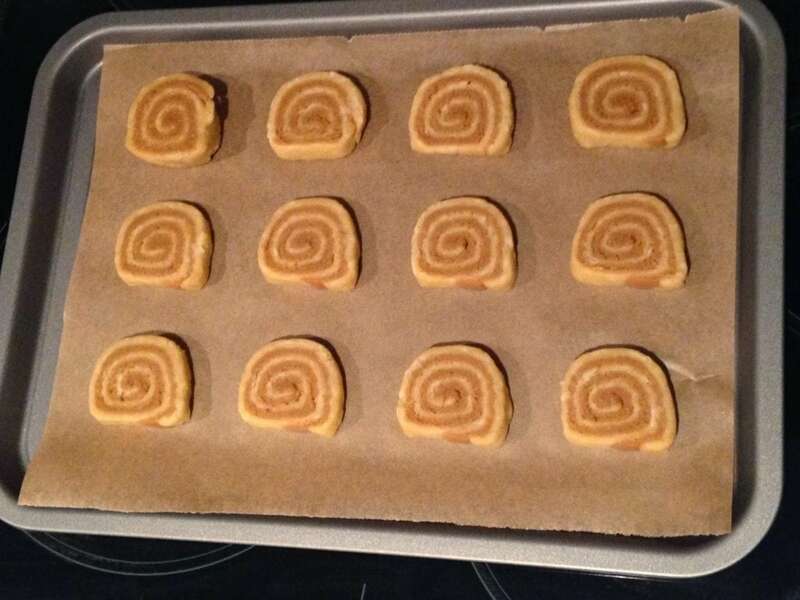 They baked the Cheese & Marmite Pinwheel Biscuits on 160C Fan/180C/350F/Gas Mark 4 for about 25 minutes. 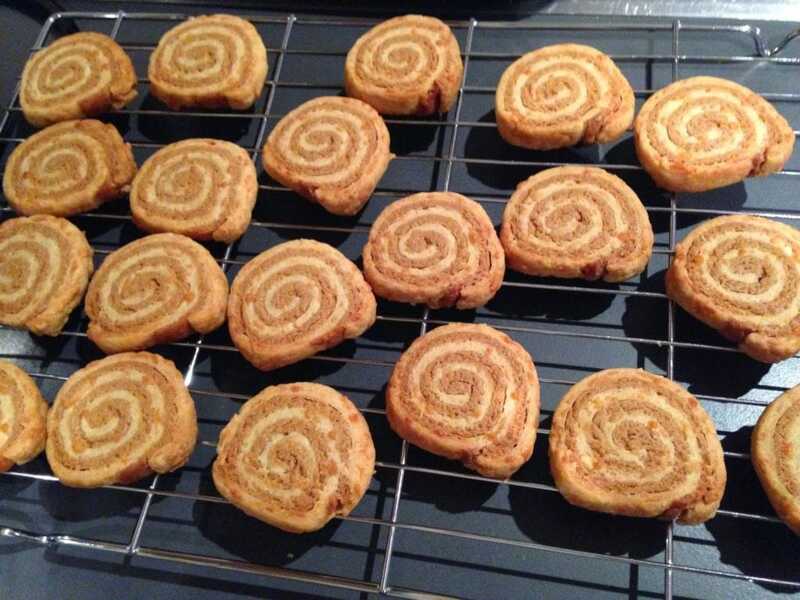 I often, if not always, bake for other people, but these Cheese & Marmite Pinwheel Biscuits were all about me! 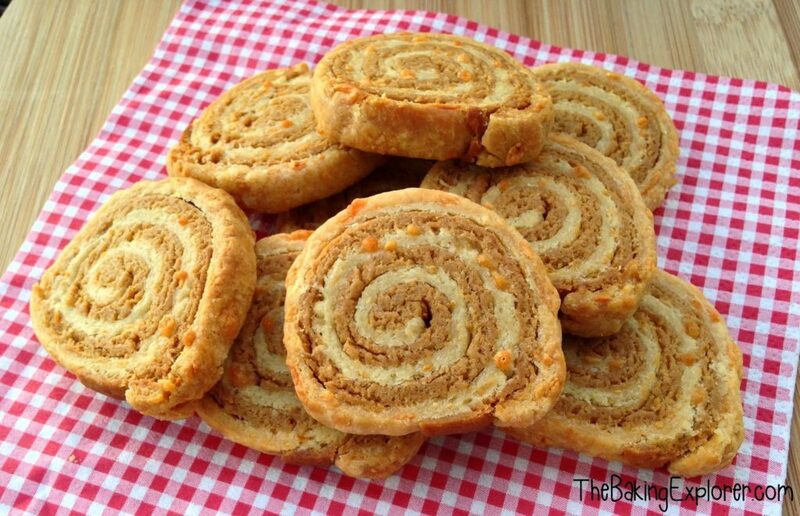 I love Marmite so much and I adored these Cheese & Marmite Pinwheel Biscuits so much that I ate about 7 of them… If you are a Marmite fan like me you will love them too! My colleagues did a good job of eating them up too. Some of them had never had Marmite before, or were unsure about it, but they enjoyed the biscuits. I was pleased and secretly hope they will soon become Marmite lovers like me. 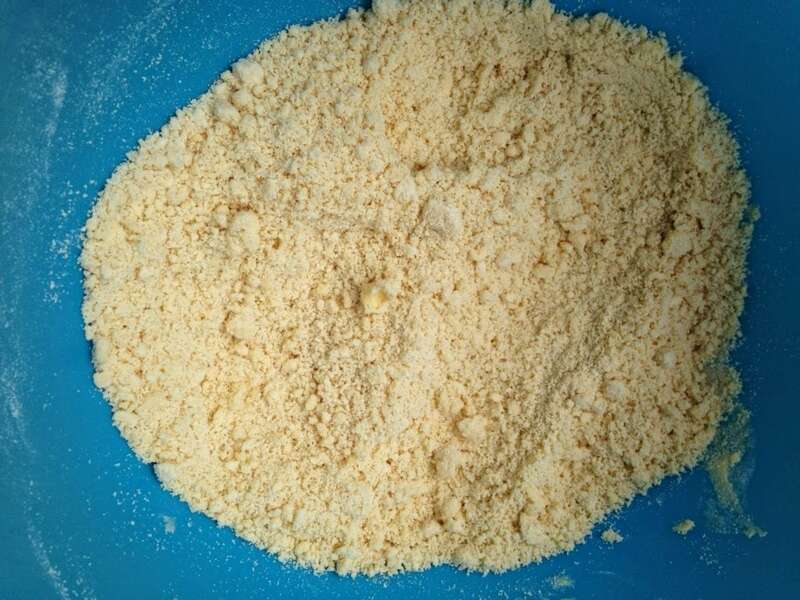 Rub the plain flour and butter together in a bowl until it looks like breadcrumbs. Split the mixture equally between two bowls. In one bowl add the cheddar and mix well to break the cheese up into small pieces. Add 1 egg yolk and mix in. Add a little egg white to bring it together to form dough. In the other mixture add the Marmite and 1 egg yolk. Again add some of the egg white to bring it together to form a dough. 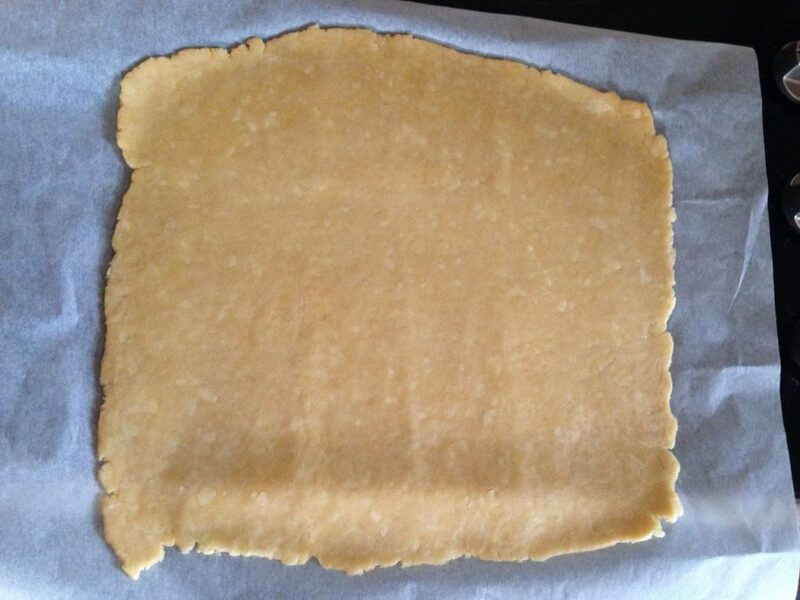 Roll out both doughs separately onto greaseproof paper until they are a similiar size. 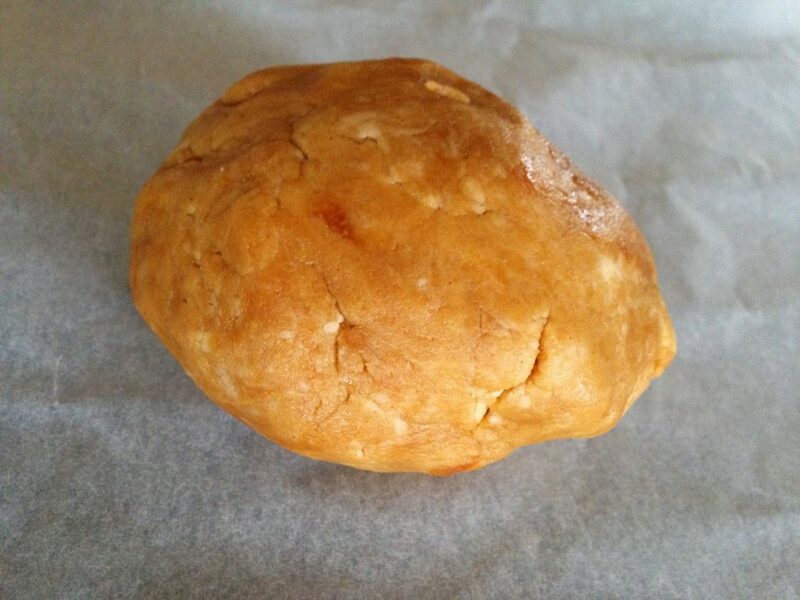 Placed the Marmite dough over the cheese dough. Roll the doughs into a tube. Wrap in cling film and chill in the fridge for about an hour. 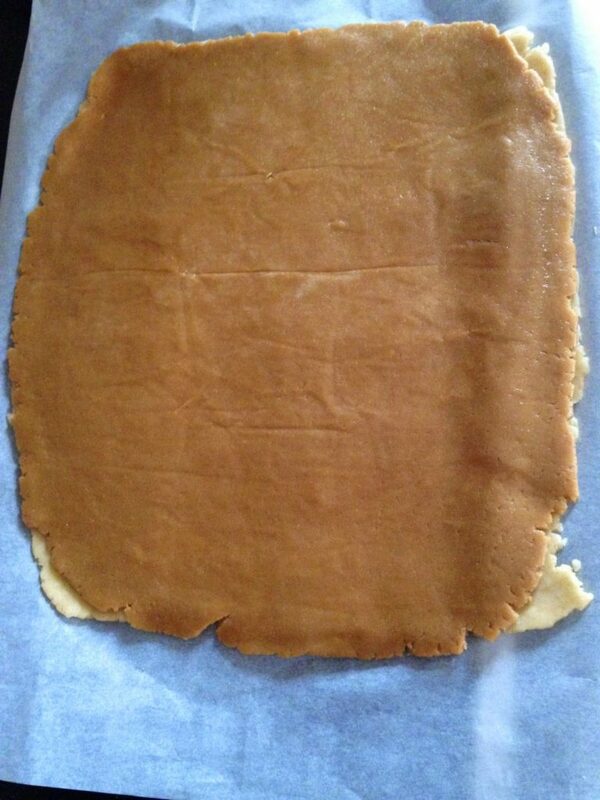 Using a sharp knife, slice up the tube of dough into pieces about 8mm thin. 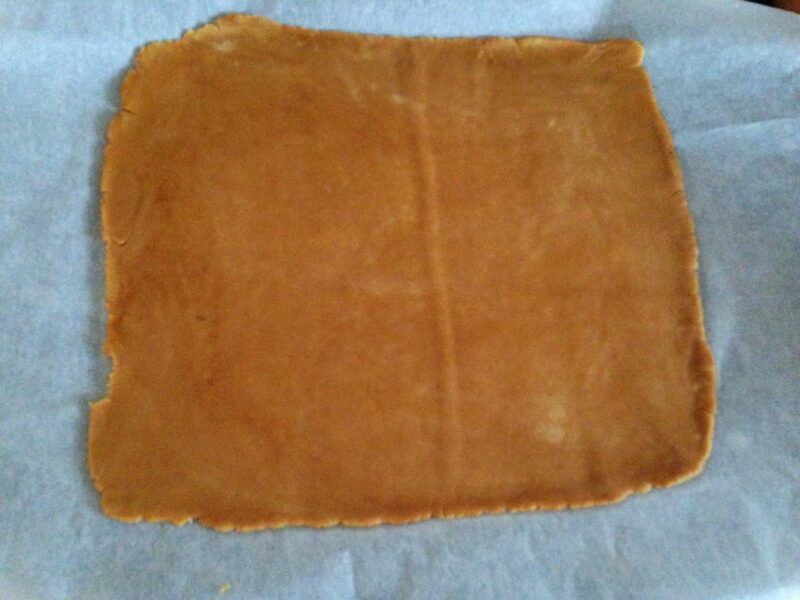 Place onto a baking tray lined with baking paper. Bake on 180C/350F/Gas Mark 4 for about 20-25 minutes until golden brown. Ooo never heard of mixing Marmite with ketchup… not quite sure about that Laura! A BIG yes for these please and also they would be perfect for picnics too!